You can call me the “Chair” man. Maybe we can go with “Chair Man of the Walnut Board”; or we could shorten it to Chairman of the Board. We already discussed my Windsor Chair with Mike Dunbar last summer, and then last month I did the Chair class with Peter Galbert at Highland. Now I get to do a Charles Brock Maloof style rocker. You can call me “Mr.” Chairman. You may have seen that Highland is offering a Maloof style Rocker in a kit form and the first kits came to the store today. I am going by tomorrow (if you really want to be the first to get one, you better be there before me) and pick one up so I can get started . 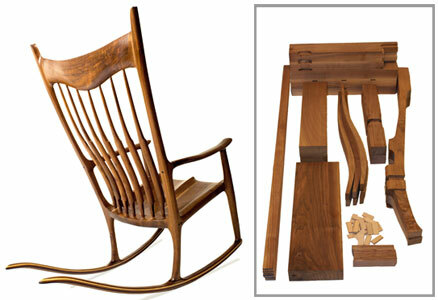 Charles Brock is teaching a class these days on building this beautiful rocker from scratch. He has set up to sell kits with all the wood you need, some pieces already shaped to fit, and the High has them on hand. I am going to pick up my kit tomorrow and start to work on it. I will write about it as I move through the process and you can follow me at the Highland Blog. I will keep a log of my time and tell you all the snags and all the good stuff. This is going to be fun! !